Control sections are important for the correct interpretation of results from multiple labeling procedures. A Troubleshooting Guide that outlines necessary controls for single labeling is available online or upon request. As in the case of single labeling protocols, “deletion controls” should be used in multiple labeling procedures. For deletion controls in multiple labeling, the first antigen should be labeled to completion with the first substrate in each section. In each control section, successive steps in the second staining protocol, i.e., second primary antibody and second detection system components, should be deleted. This series of controls will help determine whether any staining is due to the reagents of the second staining procedure binding to elements of the first labeling protocol; or, in the case of using the same enzyme detection system, the first enzyme reacting with the second substrate. Besides the usual deletion controls mentioned above, an additional control is necessary when primary antibodies from the same species are used in a multiple antigen labeling application. In this control, the second primary antibody should be substituted with an irrelevant antibody of the same species and in the same concentration range. This will help determine if any staining is due to binding of the second primary antibody by the first secondary antibody. 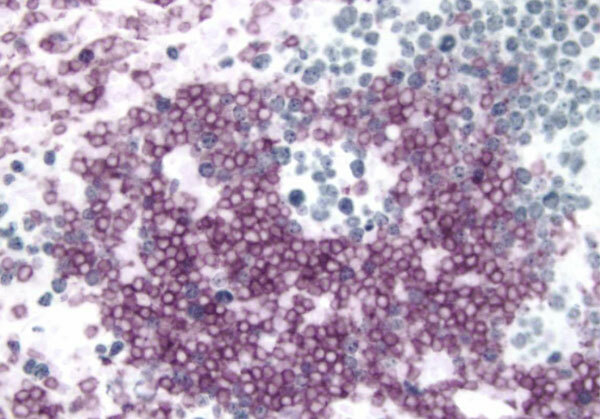 The chances of developing background staining are greater when immunostaining with multiple labels. The control sections for single and multiple labels mentioned previously will help determine which steps in a labeling protocol are contributing to the background. Described below are solutions to some common background issues. If endogenous enzyme is present in the section, an appropriate inactivation step should be introduced to eliminate staining (See Appendix 2). An avidin/biotin blocking step may be required before (for endogenous activity) and/or between labels (in case of interaction between the second labeling system and the first). To reduce background staining due to nonspecific interactions of detection reagents with the tissue, increase the serum concentration or use immunohistochemical grade bovine serum albumin (BSA; Cat. No. 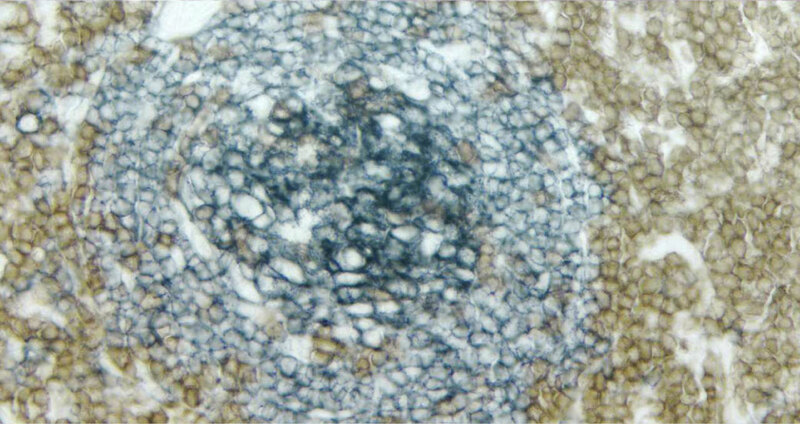 SP-5050) in the blocking/antibody solution. A detergent, such as Tween 20 (0.05%-0.2%) can also be added to these solutions. 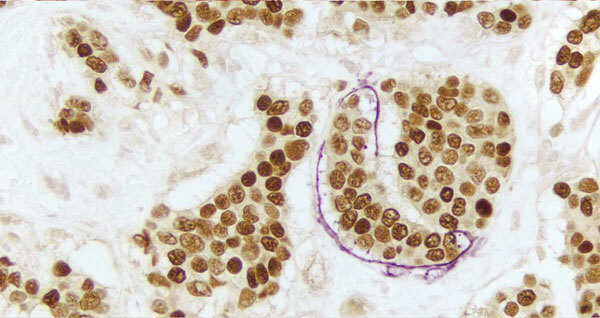 The biotinylated secondary antibody used in the second labeling system can bind to the immunoglobulins in the normal serum used in the first staining procedure. To avoid the background staining due to this crossreactivity of reagents, use a blocking serum from another species that is not recognized by either of the secondary antibodies, or use another blocking agent such as immunohistochemical grade BSA instead. • CD3 (m), ImmPRESS™ Anti-Mouse Ig Reagent, Vector® VIP HRP substrate (purple). • Ki67 (m), ImmPRESS™ Anti-Mouse Ig Reagent, Vector® SG HRP substrate (blue/gray). 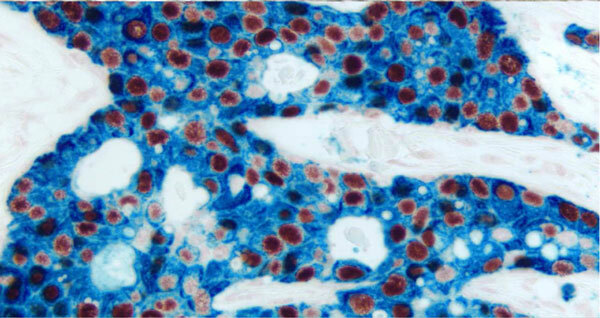 • CD3 (m), ImmPRESS™ Anti-Mouse Ig Reagent, Vector® NovaRED™ HRP substrate (red). • Ki67 (m), ImmPRESS™ Anti-Mouse Ig Reagent, DAB+Ni HRP substrate (gray/black). The relative intensities of the two colored precipitates is an important factor in obtaining the best visualization of the antigens. Adjust the concentrations of the two primary antibodies to balance the staining intensities. Observe substrate development under the microscope to monitor color intensity, especially when developing the substrate for the second antigen. In multiple label applications, a counterstain may be unnecessary or may even detract from the staining. If a counterstain is desired, it must contrast with the labeling colors and be compatible with all detection systems used. Please see Appendix 1: Counterstain/Substrate Compatibility Table (page 19). Visualizing two antigens within the same cell is possible using precipitating enzyme substrates if the antigens are located in separate cellular compartments (e.g. detecting one nuclear and one cytoplasmic antigen). If blocking of antigenic sites occurs from the first substrate, fluorescence techniques may be preferable, especially in situations when antigens are located in the same part of the cell (e.g. two nuclear antigens). See the section on “Immunofluorescence Staining Methods”. Several strategies are available for shortening a multiple antigen labeling procedure. A rapid staining protocol is available for the VECTASTAIN® ABC systems which involves using more concentrated detection reagent solutions for shorter incubation times. Alternatively, the ImmPRESS™ polymer peroxidase reagents offer a convenient, one-step detection protocol that yields sensitivities equivalent to the VECTASTAIN® Elite® ABC systems. Since the ImmPRESS™ system is a non-biotin system, it also eliminates the Avidin/Biotin blocking step(s). It is recommended that the multiple labeling protocol be completed the same day. However, if the staining protocol must be interrupted, complete the staining procedure through the development of the first substrate. Then store sections in PBS at 4 ºC overnight. After an overnight PBS incubation some substrates may appear less crisp than if the procedure had been completed without interruption. 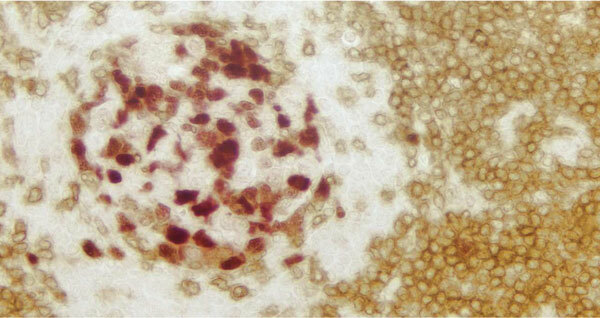 • CD3 (m), VECTASTAIN® Universal Elite® ABC Kit, DAB HRP substrate (brown). 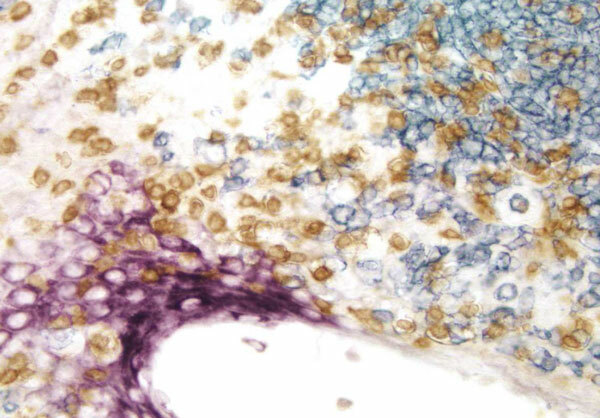 • CD20 (m), VECTASTAIN® Universal Elite® ABC Kit, Vector® SG HRP substrate (blue/gray). • Multi-Cytokeratin (m), VECTASTAIN® Universal Elite® ABC Kit, Vector® VIP HRP substrate (purple). 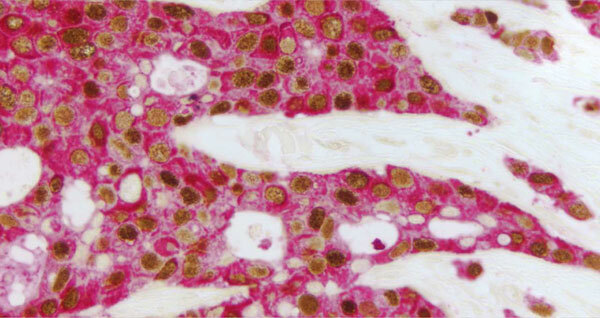 • Multi-Cytokeratin (m), VECTASTAIN® Elite® ABC Kit, Vector NovaRED™ HRP substrate (red). 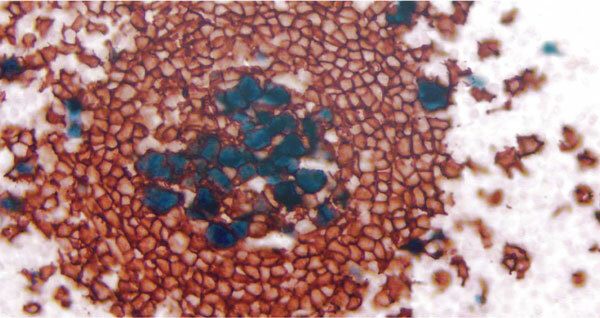 • CD34 (m), VECTASTAIN® ABC-AP Kit, BCIP/NBT AP substrate (blue). 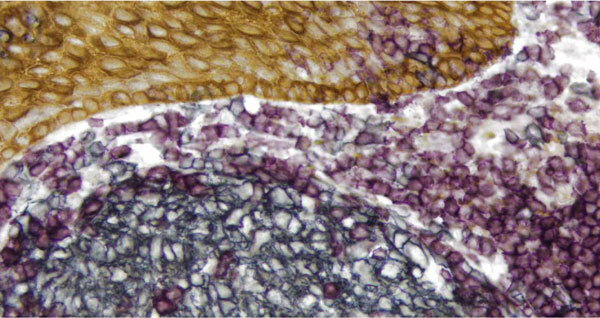 • CD3 (m), VECTASTAIN® Universal Elite® ABC Kit, Vector® VIP HRP substrate (purple). • Estrogen Receptor (m), ImmPRESSTM Universal Reagent, Vector® NovaREDTM HRP substrate (red). • Estrogen Receptor (m), ImmPRESSTM Universal Reagent, DAB HRP substrate (brown). 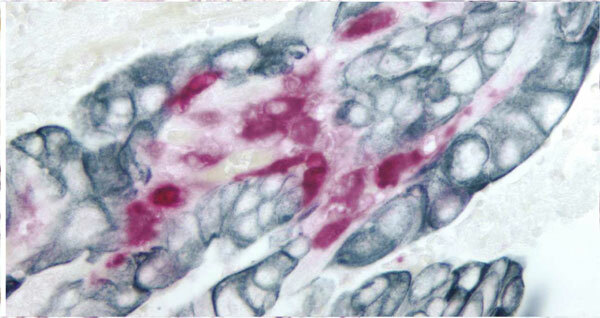 • Multi-Cytokeratin (m), VECTASTAIN® Universal ABC-AP Kit, Vector® Red AP substrate (red). 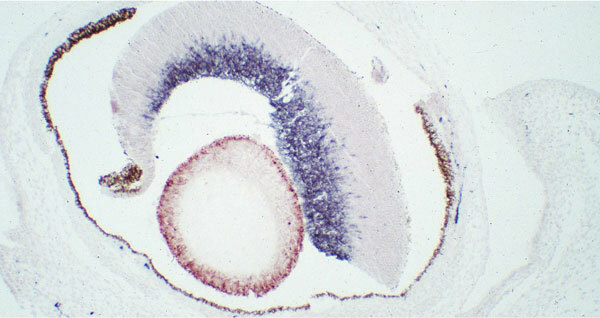 • M2A Antigen (m), VECTASTAIN® Universal Elite® ABC Kit, Vector® VIP HRP substrate (purple). 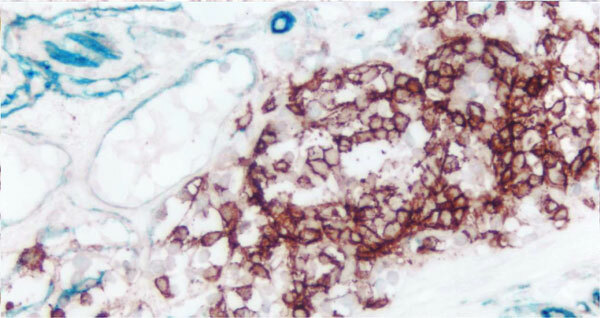 • CD34 (m), VECTASTAIN® Universal Elite® ABC Kit, Vector® SG HRP substrate (blue/gray). 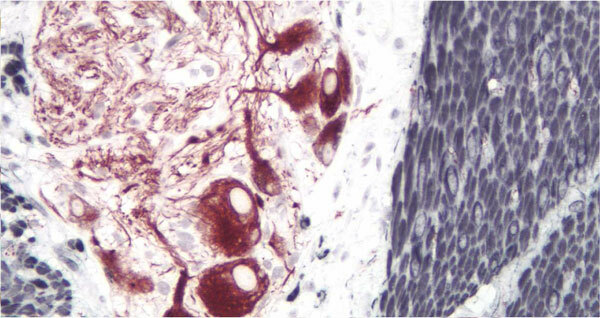 • M2A Antigen (m), VECTASTAIN® Universal Elite® ABC Kit, Vector® NovaREDTM HRP substrate (red). 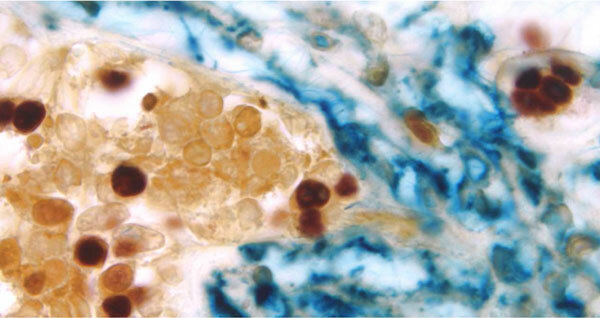 • CD34 (m), VECTASTAIN® Universal ABC-AP Kit, Vector® Blue AP substrate (blue). • Estrogen Receptor (rm), ImmPRESSTM Universal Reagent, Vector® NovaREDTM HRP substrate (red). • M2A Antigen (m), ImmPRESSTM Universal Reagent, DAB+Ni HRP substrate (gray/black). • Estrogen Receptor (rm), ImmPRESSTM Universal Reagent, DAB HRP substrate (brown). • M2A Antigen (m), ImmPRESSTM Universal Reagent, Vector® VIP HRP substrate (purple). 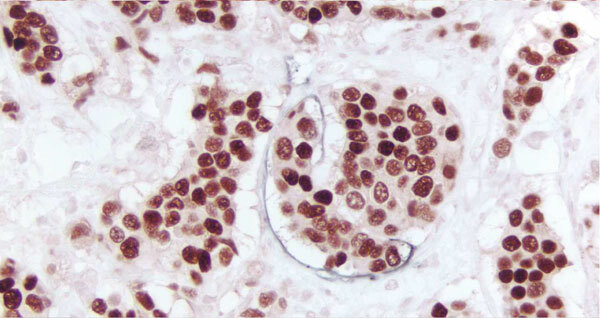 • Estrogen Receptor (m), VECTASTAIN® Elite® ABC Kit, Vector® NovaREDTM HRP substrate (red). 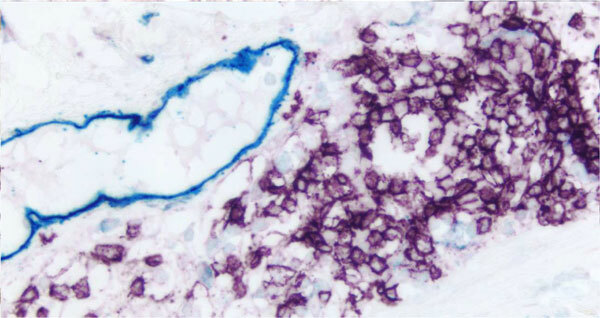 • CD34 (m), VECTASTAIN® ABC-AP Kit, Vector® Blue AP sub- strate (blue). • Cytokeratin 8/18 (m), VECTASTAIN® Elite® ABC Kit, DAB HRP substrate (brown). 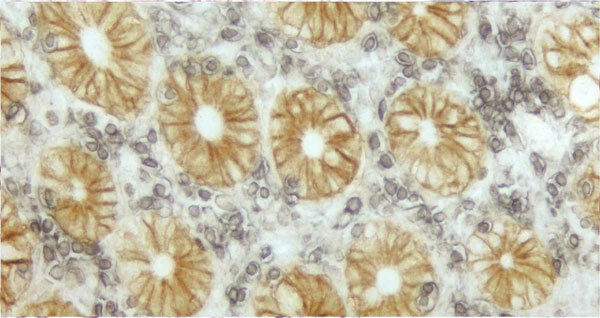 • Multi-Cytokeratin (m), VECTASTAIN® Universal Elite® ABC Kit, DAB HRP substrate (brown). 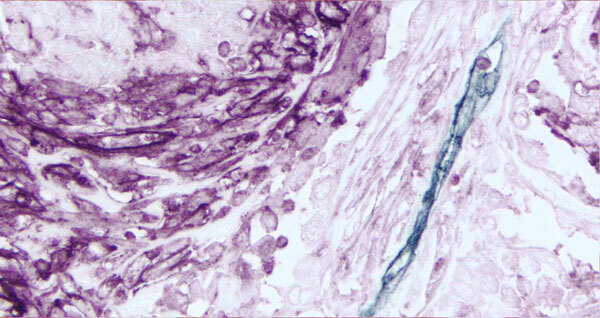 • Cyclin A (m), VECTASTAIN® Universal ABC-AP Kit, Vector® Blue AP substrate (blue). 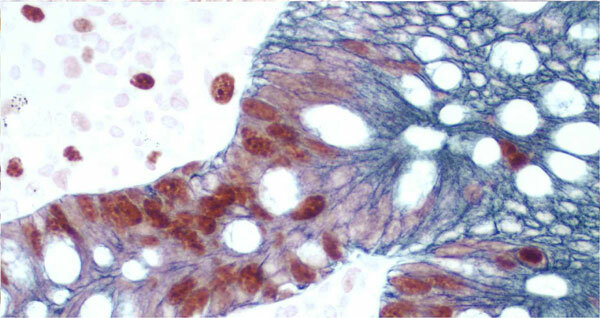 • CD20 (m), VECTASTAIN® Universal Elite® ABC Kit, Vector® NovaREDTM HRP substrate (red). 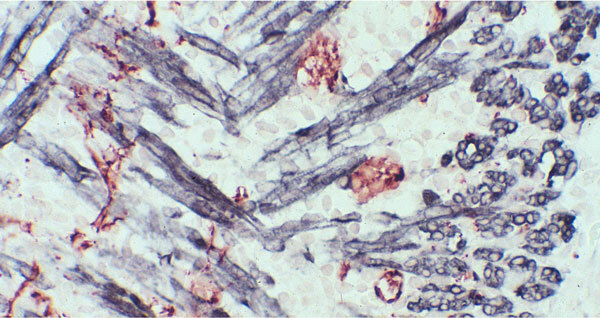 • Cyclin A (m), VECTASTAIN® Universal ABC-AP Kit, Vector® Red AP substate (red). • GFAP (m), M.O.M.TM Peroxidase Kit, Vector® NovaREDTM HRP substrate (red). • Synapsin (m), M.O.M.TM Peroxidase Kit, DAB+Ni HRP substrate (gray/black). 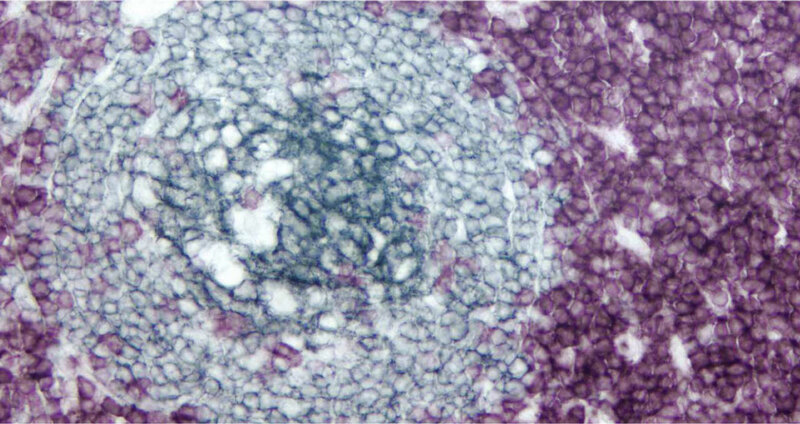 Note contrast with endogenous pigment (brown) seen in surrounding tissues. • Synapsin (m), M.O.M.TM Peroxidase Kit, Vector® NovaREDTM HRP substrate (red). • Desmin (m), M.O.M.TM Peroxidase Kit, DAB+Ni HRP substrate (gray/black). • Ki67 (rm), ImmPRESSTM Universal Reagent, DAB HRP sub- strate (brown). • CD34 (m), ImmPRESSTM Universal Reagent, Vector® VIP HRP substrate (purple). • Peripherin (m), ImmPRESSTM Anti-Mouse Ig Reagent, Vector® NovaREDTM HRP substrate (red). • Desmin (m), ImmPRESSTM Anti-Mouse Ig Reagent, DAB+Ni HRP substrate (gray/black). 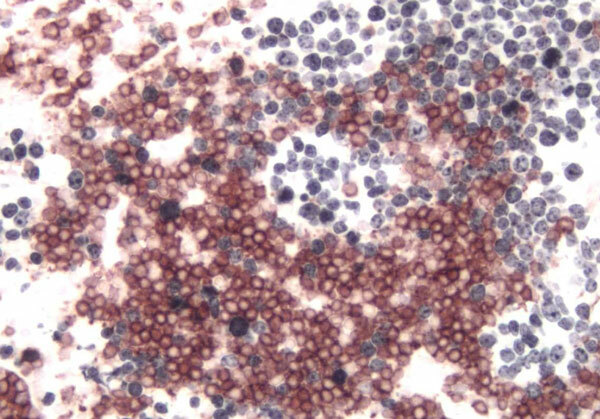 • CD34 (m), VECTASTAIN® Elite® ABC Kit, DAB HRP substrate (brown). • Cytokeratin 8/18 (m), VECTASTAIN® Elite® ABC Kit, Vector® SG HRP substrate (blue/gray). • Ki67 (rp), ImmPRESSTM Universal Reagent, Vector® NovaREDTM HRP substrate (red). • Cytokeratin 8/18 (m), ImmPRESSTM Universal Reagent, Vector® SG HRP substrate (blue/gray). 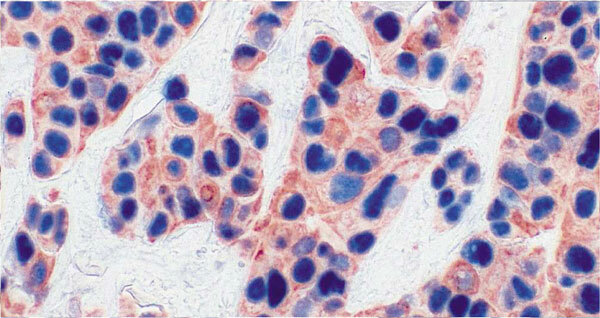 • p53 (m), VECTASTAIN® ABC-AP Kit, Vector® Blue AP sub- strate (blue). 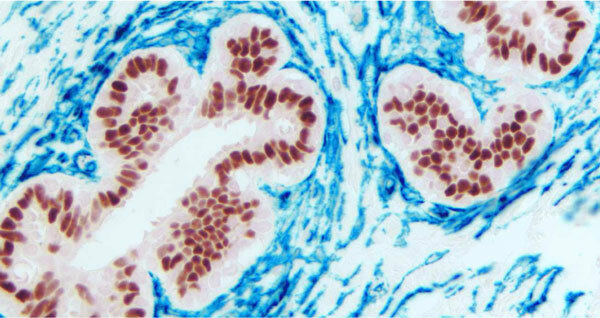 • Multi-Cytokeratin (m), VECTASTAIN® Elite® ABC Kit, AEC HRP substrate (red). • CD34 (m), VECTASTAIN® Universal ABC-AP Kit, Vector® Blue AP substrate (blue).>br> • CD20 (m), ImmPRESSTM Universal Reagent, Vector® NovaREDTM HRP substrate (red). 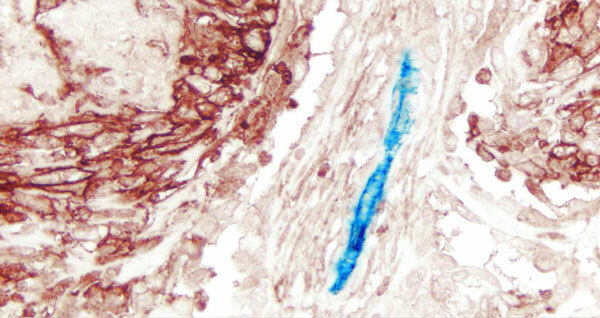 • M2A Antigen (m), VECTASTAIN® Universal ABC-AP Kit, Vector® Blue AP substrate (blue). • CD20 (m), ImmPRESSTM Universal Reagent, Vector® VIP HRP substrate (purple). 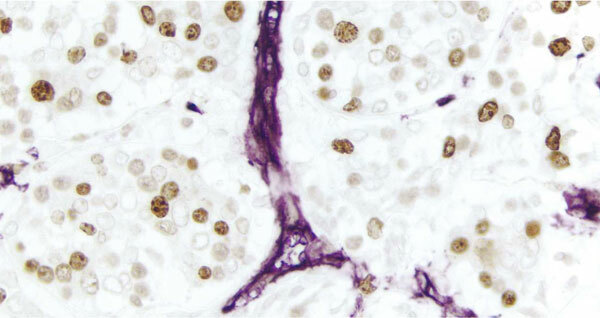 • CD45 (m), VECTASTAIN® Universal Elite® ABC Kit, DAB+Ni HRP substrate (gray/black). 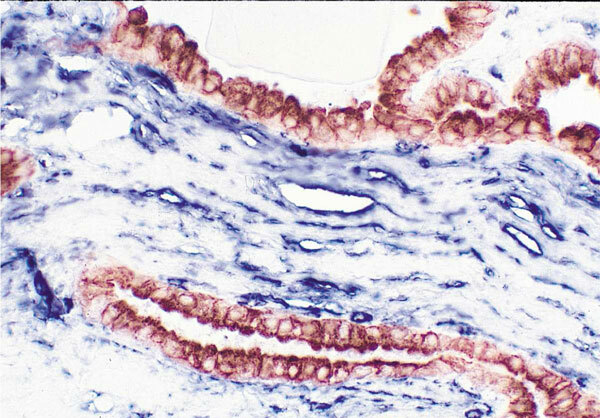 • Epithelial Specific Antigen (m), VECTASTAIN® Universal Elite® ABC Kit, DAB HRP substrate (brown). 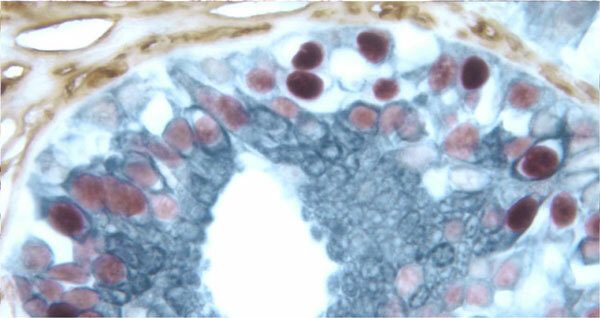 • S100 (rp), VECTASTAIN® Universal ABC-AP Kit, Vector® Red AP substrate (red). • Cytokeratin 8/18 (m), VECTASTAIN® Universal Elite® ABC Kit, Vector® SG HRP substrate (blue/gray).